Now, you don’t have to make a separate trip to the pharmacy for prescriptions ordered by your physician. For your convenience, NYOH can fill many prescriptions right at our offices. Just pick up at the location where you see your doctor—or the medications may also be delivered directly to your home. Cancer treatment is complex and requires close monitoring. It can also be very expensive. That is why our pharmacists are specially trained in cancer treatment and focus exclusively on NYOH patients. They work closely with your physician on an individualized treatment regimen, ensuring you receive medications in a timely manner. At our NYOH Patient Prescription Center, we also take the time to verify your insurance coverage for medications. Our dedicated pharmacy staff investigates Medicare, supplemental plans, co-payment assistance programs and other options—to make sure you are getting the maximum drug benefits available. To learn more, ask your nurse or physician about in-office dispensing. Do you accept my prescription benefits coverage? In most cases, yes, we do. We are able to process prescription claims with most major prescription benefits providers. We are also able to process Medicare Part B and Part D prescriptions, as appropriate. Keep in mind that some plans require the use of a mail order pharmacy to fill prescriptions for long-term use. We can help you determine the best available option for filling your prescription. Will it cost me more to fill my prescription here than at a retail pharmacy? No. In fact, many times it can cost less to fill your prescription at our office because retail pharmacies often require immediate payment and may not be able to verify all coverage options before dispensing. These include Medicare, supplemental plans, co-payment assistance programs, etc. Since we are able to do all of this before dispensing your medication, as well as investigate alternative co-payment assistance resources, it is possible you can save money. Do I have to fill my prescription at your office? No. You are always welcome to fill your prescription at any pharmacy that accepts your prescription benefit coverage. We are offering this service as a convenience for our patients. 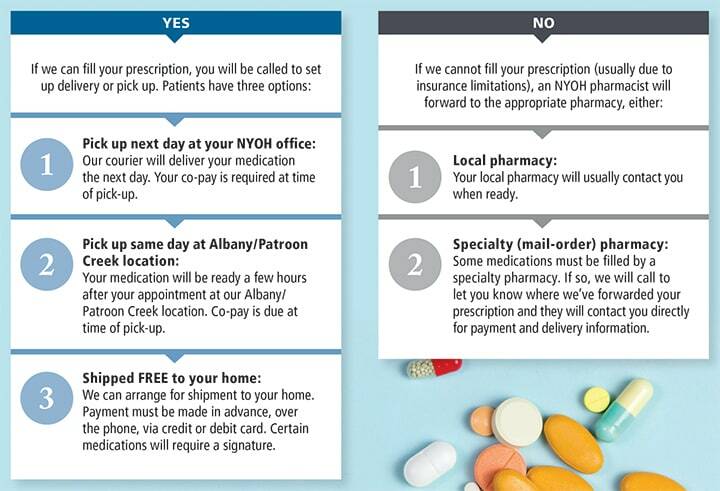 Should you decide to fill your prescription at another pharmacy, your decision will not affect the medical care you receive from our team at New York Oncology Hematology. We will fill your prescription as quickly as possible, following verification of available prescription benefit coverage and alternative co-payment assistance resources. It may be available immediately. If not, we will call you to arrange a time to pick-up your prescription and discuss your treatment plan with our pharmacy team. Talk to your doctor or nurse to get started today. Make sure you have provided your prescription benefit card to the receptionist to participate. We will take care of the rest, and be there to help you every step of the way. 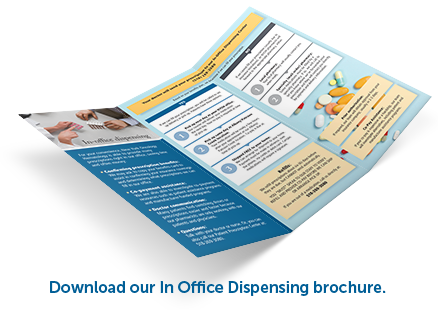 Why are you offering in-office dispensing? At NYOH, we are committed to providing the best care and service for our patients. We know it can be confusing to deal with prescription benefit coverage for medications used in your treatment. That is why we are happy to do the work for you. Our doctors know the sooner you can start treatment and more closely you follow your treatment plan, the better. That is why we are offering this service and our staff is here to help.